I love having a good nose into other peoples’ craft studios/sewing rooms/work spaces – whatever you want to call them. They’re just so inspiring! Anyway, when we no longer had the need for a fifth bedroom (for which, read ‘loft’), I laid claim to the peaceful space under the eaves and set about creating my perfect workspace. Perfect for me, that is, so I could put my hands on whatever I need immediately, without wasting precious sewing time hunting for pair of (sharp) cutting shears, NOT the really expensive pair that my husband ruined borrowed to cut cardboard (“But they’ll be fine – I only used them once….”). Nobody comes up here, not because they’re well trained or under threat of death, but because there’s nothing of interest up here for them (apart from my old iMac which has been superceded by the latest model for my Photography business, but is perfectly suited for browsing Pinterest and Blogging). So I spend many happy hours in creative peacefulness surrounded by fabric and yarn – there’s even a pretty fabulous view when I stand up and look out of the velux window. The fact that I still enjoy peeking into other craft studios prompted the creation of a separate, easy-to-find, dedicated page devoted entirely to images of my new space. Find lots of photos of my loft craft room under the tab named “My Craft Studio” at the top of the page. Here’s a taster…(click on the image for a larger picture). Categories: Everything Else! 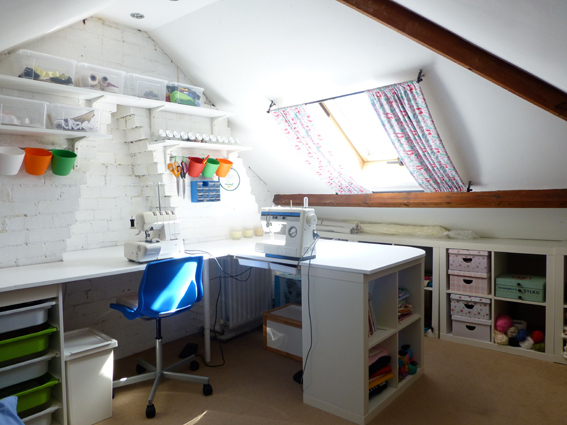 | Tags: attic, craft room, craft studio, loft, sewing room, work room, work space, workshop | Permalink.